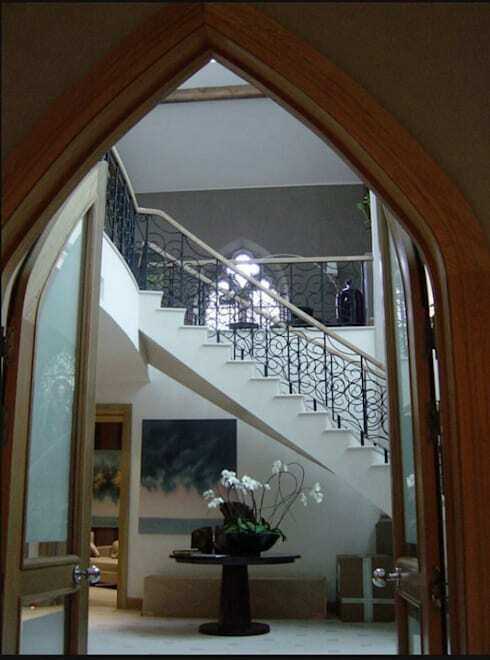 Once you enter the house, you are welcomed by a grand looking staircase. 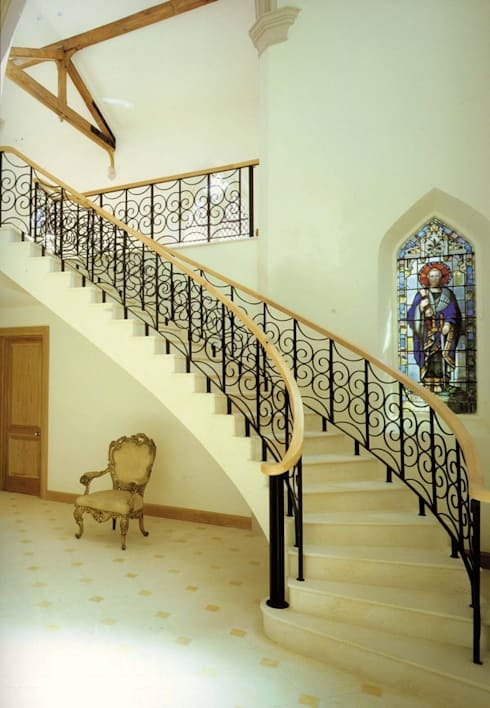 The railings on both sides have been carefully crafted using wrought iron. while the floor and staircase steps are lined using elegant marble. The hallway maintains its character and authenticity with the stained glass windows of the original church. Although the house showcases a Victorian-inspired design, it still has a few modern elements. 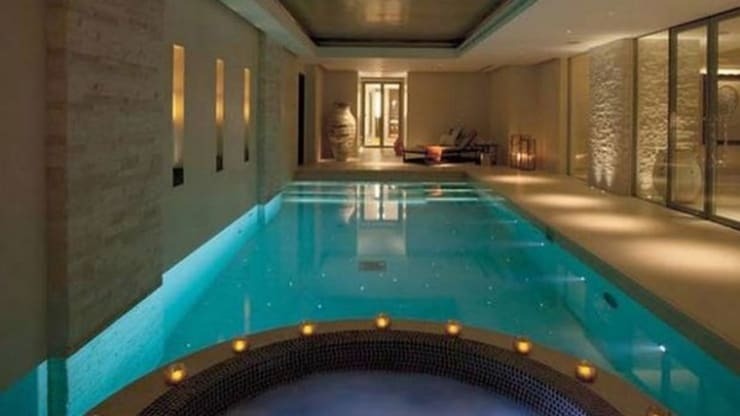 This can be seen in the form of an indoor swimming pool. Besides, there are two different pool areas created. While one features a mosaic tile pattern. The other is designed using plain blue tiles with LED lights. There is even an L-shaped sitting and walking area near the pool. 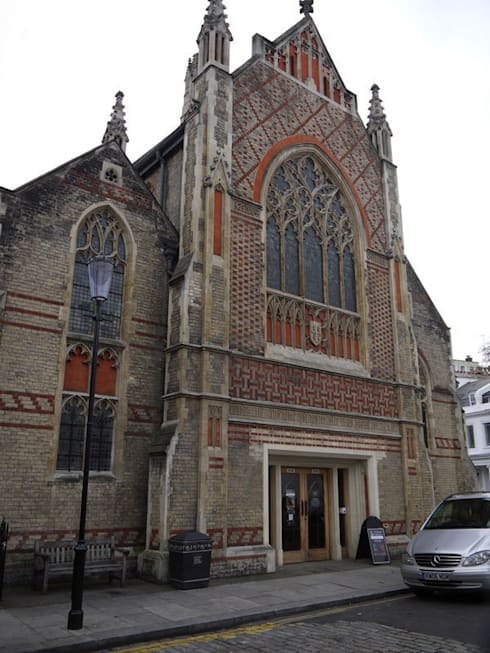 This building is a grand looking structure and its main door also matches that same aesthetic. 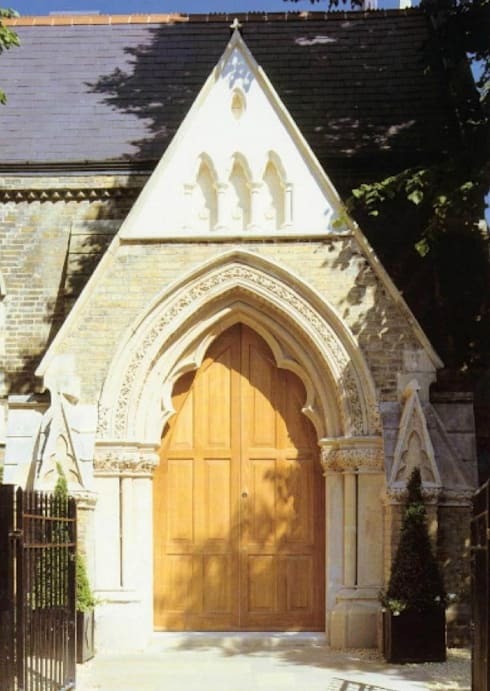 Created using all natural wood, the design features a simple embossed pattern with the light colour of the door complimenting the overall brick and plaster exterior beautifully. 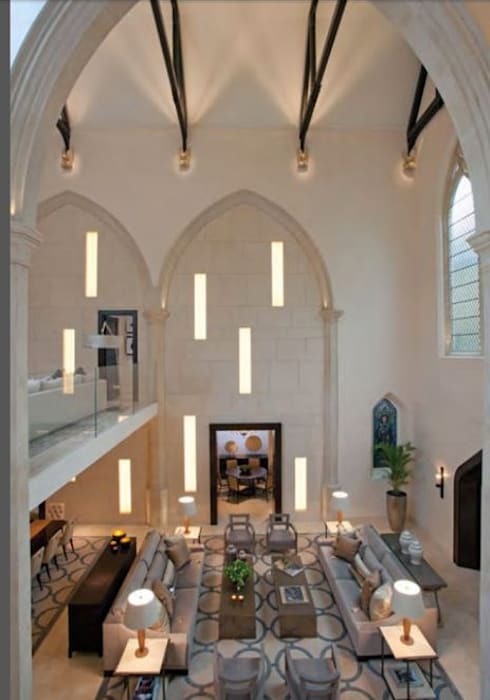 It doesn't get more grand the huge lofted ceilings of the main living space. The entire area is basked in light but with the help of large carpets and well placed furniture, things don't end up looking lost in this immense space. Neutral shades like grey and black provide a welcome contrast to the otherwise white interiors. Due to the sheer size of the building, there are many hallways incorporated. A typical hallway has a beautiful wood and glass door, which leads to all the other openings. In this case, you can see the entrance to the first-floor. 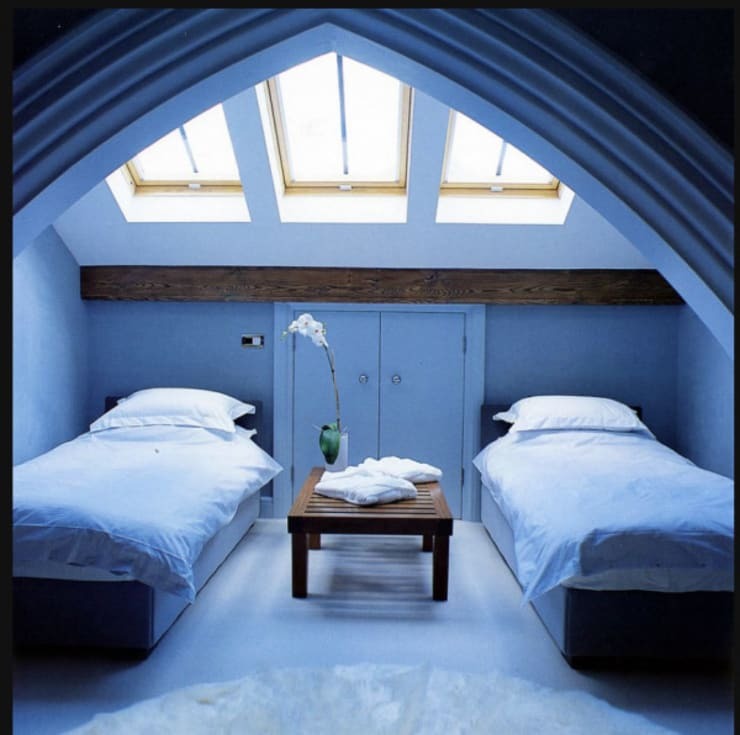 Even the attic of this Victorian-style mansion has been put to full use with space transformed into a beautiful guest bedroom. Things are kept a little more simple here with an amazing skylight making sure that the room gets an ample amount of natural sunlight. 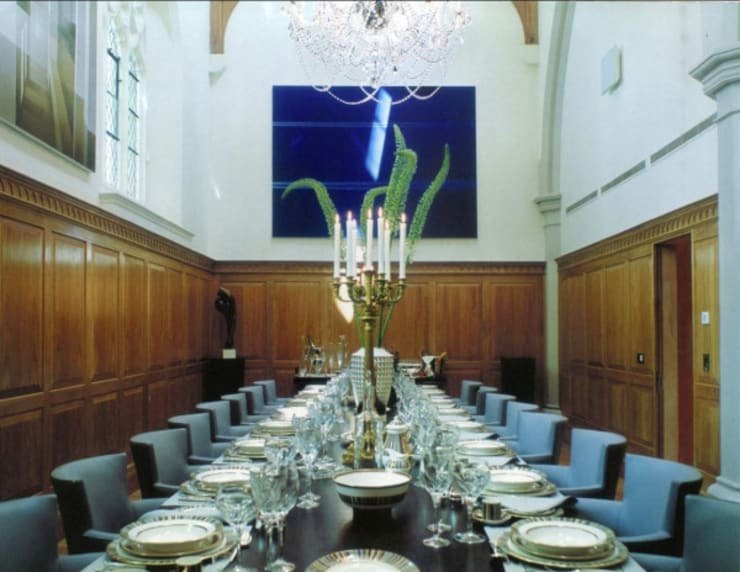 The last room of this mansion is a sprawling dining area. Able to accommodate twenty people at once, the room is absolutely perfect for hosting. The walls of this dining area are lined with wooden panels halfway up the walls with windows placed high up, all adding to the intimacy and seclusion of this dining space.